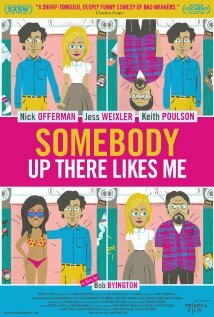 Somebody Up There Likes Me is an indie comedy that will no doubt fly under most people’s radars. 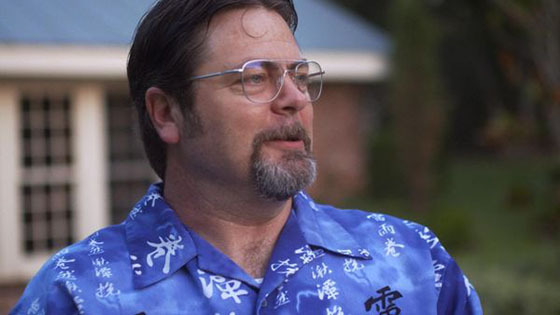 Its biggest selling point is its co-producer, Nick Offerman, who also has a supporting role in the film. Without him, I imagine this would have a hard time gaining any traction. 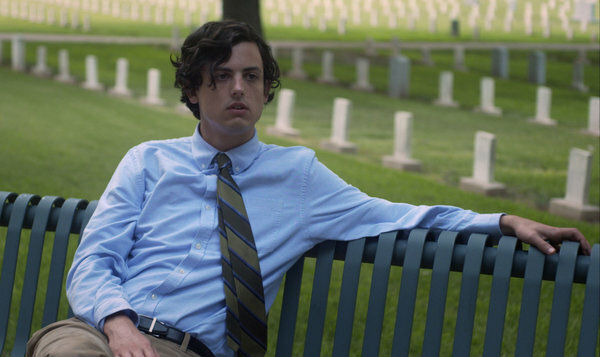 The film follows the life of aimless twentysomething Max (Keith Poulson), a waiter who is recovering from a divorce. He works with his best friend, Sal (Offerman), and falls in love with another co-worker, the breadstick-chomping Lyla (Jess Weixler). Max and Lyla quickly get married, and the film shows their subsequent life together in five year increments. The two of them have a kid, get rich, have affairs and struggle as parents, all within the film’s 76-minute running time. Max never ages in appearance, and the other characters only show their age via subtle changes to their hair color. Max is also in possession of a mysterious briefcase that emits blue color when opened — perhaps that is the source of his seemingly eternal youth? Not unlike Pulp Fiction, we are never shown what’s inside. There’s a lot crammed into the film’s brief length, yet it feels like nothing of any substance ever happens. Major life events come and go in a matter of minutes. While this is a part of the film’s shtick, it makes it hard to care about any of the characters. It doesn’t help that Max is a completely unlikable guy anyway. His disenchanted and apathetic demeanor (think Napoleon Dynamite) isn’t appealing in the slightest, and it’s miraculous that he manages to stumble his way into success while hooking up with beautiful women as if it were nothing. Sometimes his deadpan delivery gives way to some good jokes, but most of the time it falls flat. The best moments of the film come from Nick Offerman’s character — no surprise there — even though he isn’t given much to work with. Sal isn’t terribly different from Ron Swanson (of Parks & Recreation), but his blend of sarcasm never fails to amuse. There are also a couple of welcome cameos from Kevin Corrigan and Megan Mullaly. In the end, there isn’t a whole lot to separate Somebody Up There Likes Me from the countless other indie comedies that have come out in recent years. Even its unique characteristics, such as Bob Sabiston’s (Walking Life, A Scanner Darkly) animated interludes, are underutilized and fail to paint a lasting impression. There’s a lot of talent in this film, but sadly it never comes together as any more than a one-off project. On a side note, I went to a screening where Nick Offerman did a Q&A in person. Those 10 minutes of Offerman speaking were more hilarious than anything found in this movie. You’re right, I had never heard of this indie. Checked the trailer, and seems like Nick Offerman steals it. A shame the movie didn’t work out for you. Glad you enjoyed the Q & A at least! To be honest, I probably wouldn’t have bothered with this film if not for the Q&A. But it was still a fun night even though the movie disappointed. I was planning on seeing this since I’m a big fan of Parks and Rec but I’ll guess I’ll skip it. Nice review. Yeah, not much to see here. On the plus side, the film is only 76 minutes long, so if you’re curious it won’t take up much of your time. That’s too bad it isn’t very good. I remember seeing the trailer and being quite hopeful. All’s not lost if you’re an Offerman fan — The Kings of Summer comes out in a few months, and it has glowing reviews so far. I’ve never heard of this movie and I’m not sure I’m interested in seeing it after reading your review, Eric. I’m familiar w/ Jess Weixler, she was in Best Man Down (previously called Lumpy) which turned out to be a pretty good film. This was the first I had seen from Weixler. She was decent enough, but again, not much material to work with here. I might have to check out Best Man Down. I just watched it. Don’t let others’ reviews decide whether you see it or not. It might not be for everyone, but I was mildly entertained. Maybe a bit more than mildly. Interesting little flick. Hi Julie, glad to hear you enjoyed this more than me. I can’t say I was bored during the film or anything, it just didn’t do much to stand out from countless other quirky indie flicks.